The Writer's Quarters | If you like to write, you've found the right place. You may have noticed I changed the header image of my site. That was actually sparked by the comment of a close friend. Why have a random photo of books when I can display the ones I loved most growing up? I actually had a lot of fun choosing exactly which books I would include in that photo. And of course it was an extremely difficult task – I was and still am a voracious reader, and being forced to exclude some books was heartbreaking. But I do think I managed to capture many of my favorites! You’ll probably notice that most of the titles are well-worn (“Island of the Blue Dolphins” is barely legible), and I guess that’s the true mark of the countless days I spent reading as a child. I have distinct memories of pretending to be Karana, stranded on an island and making a skirt of cormorant feathers. I still love reading children’s books. Sometimes it seems to me that novels written for older audiences underestimate the value of a good story and try too hard to evoke a deeper theme. The adult is more sophisticated, the author feels. I must write something intellectually stimulating; I need some heavy prose. Some deep emotion. And in the search for something profound, the good story falls by the wayside. Don’t get me wrong; I’m not saying every novel written for older audiences fails to tell a good story. It’s just that due to the nature of the genre, middle grade books don’t feel the need to wow their audience with anything more. In children’s books, we’re more likely to find adventure and the hero’s journey. We get unforgettable characters with runaway imaginations. And more than anything, the stories are just plain fun. As we journey into young adult, we (understandably) get into more angst, and before long we reach the adult section, where a good story is simply not enough. No, we’re too old and wise for that now; we’re no longer children. We expect more. I think the best books, regardless of their audiences, are well-written, tell a good story, and leave us with a meaningful message. Does it have to be over-the-top brilliant? Heck no. But if it makes us feel, makes us laugh, cry, or smile – well, that’s enough for me. For the past few weeks, I’ve had the opportunity to see three little robins grow up, from the moment the mother laid her eggs in the nest until the moment those little birds began to fly. It was a delightful experience, checking on the nest each day and seeing those hungry mouths waiting for food, and then spotting the baby birds hopping along in the grass after their mother. I also learned a lot about robins along the way. Did you know that baby robins must be fed as much as they can eat every half hour from sunrise until sunset? Those parents sure have to work hard! Even after they leave the nest, the fledglings have to stick around and be fed by their parents for three weeks. I wish I had a better picture of the robins, but I try not to go too close to them, so they don’t get scared. 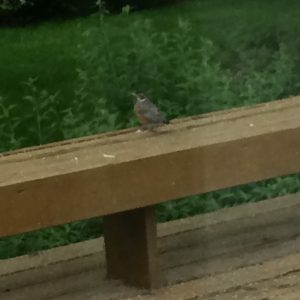 The robin on the bench in this picture is one of the babies. He’s grown up quite a bit, but he’s still got some fuzz on his head and he still has to follow his mom around for food. I don’t really know how to describe it – but watching birds in the backyard makes me smile so much. It’s peaceful and it gives me this happy feeling watching them play in the birdbath or hang around in the yard, hopping around on those little feet and digging for worms. And I love hearing their sweet little chirps, especially since they’re all different. The cardinals have got this long chirp that sounds so loud coming from their tiny bodies. And the robin babies make such a racket when their mom comes back with food. They just sit there in the nest with their mouths open, going “peep peep peep!” I love it. Sitting in the yard and watching these birds have a grand old time makes it truly feel like spring. I hope that no matter where I go, I’ll always be able to enjoy the sights and sounds of these lovely little creatures! P.S. My new poem makes a reference to robins in the birdbath. Check it out on the sonnets page here: http://sarrahhakim.com/poetry/sonnets/ Scroll down until you find the one called “Home.” I hope you enjoy reading it! A little while ago I read The Alchemist by Paulo Coelho. And I loved it. The story not only resonated with me, but it also caused me to reflect on my own life and my own Personal Legend (more about that to come). The story itself is quite simple: Santiago, a young shepherd in Andalusia, has a recurring dream about a treasure at the base of the Pyramids. He ultimately decides to make the journey to Egypt to find the treasure. On his way, he encounters people from different walks of life and learns about the world. Perhaps the beauty of the book lies in its simplicity. In just a few words, Coelho is able to convey universal truths about life that are applicable to anyone at any point in his or her own journey. At one point, Santiago loses all he has to a thief. He has given up everything to travel to a strange land, and now he is alone and possesses nothing. He realizes he has two ways to look at the situation: he is either the poor victim of a thief or he is an adventurer on a quest for treasure. He decides, “I’m an adventurer, looking for treasure.” In such a simple way, Coelho shows us that we too can decide whether we are victims of life’s trials or whether we are adventurers on a quest to fulfill our Personal Legend. Along the same lines, there comes a point where Coelho writes, “When each day is the same as the next, it’s because people fail to recognize the good things that happen in their lives every day that the sun rises.” It’s something that I don’t often think about, but now that I do, I realize how much truth the statement holds. There have been so many times when each day seems to blend into the next. I have a set routine: go to class, do homework, take exams, eat, sleep, repeat. And I forget to acknowledge good things that happen to me – because indeed, every day is like an adventure, and every day is full of good things, full of new and exciting possibilities. It’s all about how we look at it. And, above all: the Personal Legend. Coelho uses this term to mean one’s destiny or purpose in life. The entire story revolves around the fact that everyone, every living thing, has a Personal Legend. A life’s calling. And we know what this calling is from a young age, but few of us pursue it. According to Coelho, the world’s biggest lie is that at some point in our lives we lose control and no longer have the ability to fulfill our Personal Legend. This is what we believe, but it’s not true. In fact, “people are capable, at any time in their lives, of doing what they dream of.” In other words, it’s never too late to start doing something you’ve always wanted to do. I don’t want this post to become too long, so I’ll stop now (although there are really so many other moments and life lessons that struck me as incredibly thought-provoking and inspiring). I highly recommend reading The Alchemist if you haven’t already (or reread it if you have!). It’s a short read but contains so many universal truths. I think the first draft of anything should be written like a kid. Forget the self-editing, forget the voice in the back of your head. Write for pure enjoyment. Because during that time, during the first draft, you are invincible. You’re invincible, you’re perfect, and your writing is the best thing that has ever graced this planet. Once it’s written, you can go back and edit – you can tear it to shreds if you need to – but right up until the end of that first draft, you’re a kid on top of the world. So write like it! Most people don’t regret what they’ve done. They regret what they didn’t do. This past winter semester of college was possibly the most stressful I have experienced thus far. Now that it’s the middle of summer and my head has cleared a little bit, it’s beginning to hit me how fast everything is going by. I’ll be honest – last semester wasn’t the most enjoyable. I felt like a workhorse, constantly toiling, but without a clear end in sight. I was so caught up in struggling to stay on the boat that I lost sight of where the boat was going, and I forgot to enjoy the ride. I think it’s easy to forget, especially at certain points in life, that whatever we’re going through is a small piece of a larger puzzle. This is precisely what I did last semester, and I don’t want to spend another one like it. But sometimes it seems to me that life is a paradox. People tell you to think of the “big picture” but they also tell you to “live in the moment.” So what does it mean? Well, from the perspective of a college student, it means keeping in mind that studying all night and cramming for tests is part of a larger goal, a greater purpose. That’s the big picture part. If you’re looking for some inspiration, take a moment to watch this video!